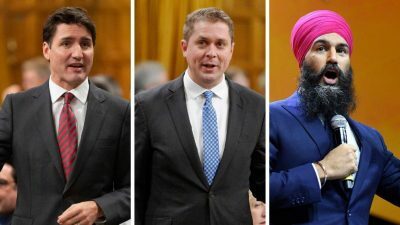 Conservative and NDP Leaders Andrew Scheer and Jagmeet Singh are calling for an emergency meeting of the Common’s Standing Committee on Justice and Human Rights to question the Prime Minister’s Office and others over potential interference in an ongoing criminal prosecution. Scheer says allegations the PMO pressured the former Attorney-General, Jody Wilson-Raybould, to get involved have raised alarming concerns over the conduct of Justin Trudeau and his office. ”If the Prime Minister has nothing to hide, then members of his government should have no reason to oppose these officials from testifying. If his MPs vote against a motion and try to cover up what happened, Canadians can only conclude that the reports of political interference are true,” said Scheer. Meanwhile, Wilson-Raybould says she will not comment because of the pending legal action against the construction company. SNC-Lavalin has pleaded not guilty to bribery and corruption in a bid to secure government business in Libya. The case is at the preliminary hearing stage. If convicted, the Quebec-based company could be blocked from competing for federal government contracts for a decade.